I am yet to meet a kid that doesn't love the farm. The mud, the noises, the smells and the animals. Being able to get up close and give a goat a pat, say hello to the ponies and smile at a donkey (seriously - check out that GRIN!). 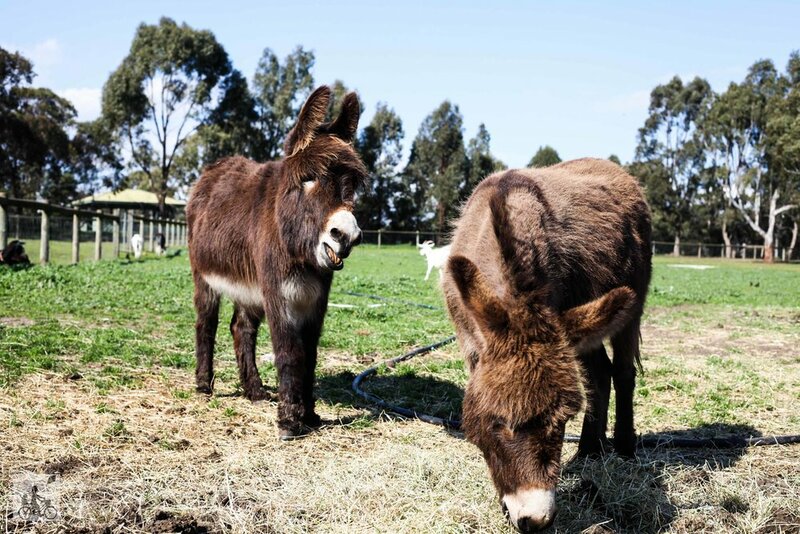 All is here at Bundoora Park Farm - a council run farmyard in the north of Melbourne. This place really has everything including a walk in barn yard where you can pat the lambs and goats, as well as opportunities to cuddle the guinea pigs and rabbits. Be sure to check out the view from above the alpaca yard and check the Farm Activity Schedule for feeding times and milking demonstrations. There are tractor rides (at additional costs) through the native wildlife reserves so you can wave to the kangaroos and emus. As well as a heritage village that you are able to wander through and imagine what it might have been like to live in the 'olden days'. Need more? How about a massive wooden playground with a mammoth slide in the middle of the farm. Well they have that too! A seriously fun day out for all the family. Mamma's special mention: You can't visit the farm without visiting the cafe and then hopping next door for a visit to the All Abilities Playspace. Or of course you can time your visit with the Bundoora Farmers Market which happens on the first Saturday of the month in Bundoora Park.